The Scioto River originates in west central Ohio and travels through the center of the state before spilling into the Ohio River at Portsmouth. For centuries, even millennia, the river has provided sustenance, transportation and recreation for the inhabitants of the region. Prehistoric Hopewell Indians lived along its banks as evidenced by ceremonial mounds found along the route. Civil war refugees used the river as an escape route from slavery. Farmers have utilized the fertile river valley banks for profitable crops of corn and melons. 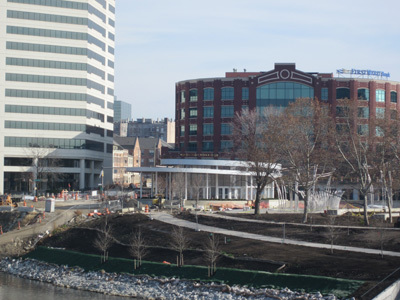 Today, the Columbus Downtown Development Corporation (CCDC), a private nonprofit, is using the river as the focus for a 5 prong redevelopment of the downtown. The CCDC, formed in 2002, is comprised of business and institutional leaders charged with implementing the City of Columbus Downtown Strategic Plan. 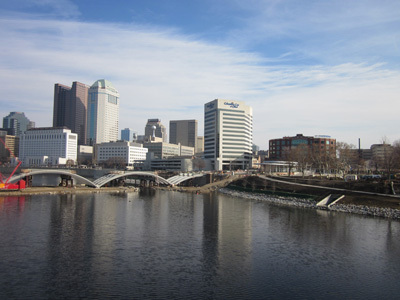 The plan for the Scioto River is to create a mile long green corridor to attract people to the downtown through a variety of events, thus fostering interest in living and investing in downtown Columbus. One of the core principals has been the marriage of public and private funding of the development. Of particular interest is the participation of American Electric Power. AEP has provided $10 million towards the project. The river front is all about energy . . .energy which is displayed in many different forms- the flowing river, massive new water fountains, the active participation of bikers, hikers, wall climbers and . . .175 solar panels for electrical energy. 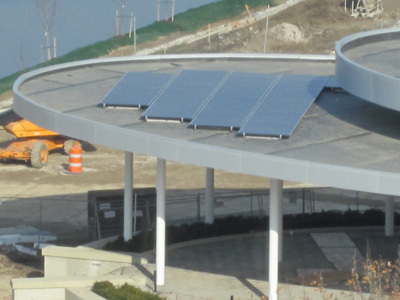 These solar panels will furnish electricity for a planned cafe and water features. So why would AEP encourage such an investment in alternative energy ? According to Dale Heydlauff, Vice President of Corporate Communications for AEP, it is an outgrowth of AEPâ€™s commitment to giving back to the community. 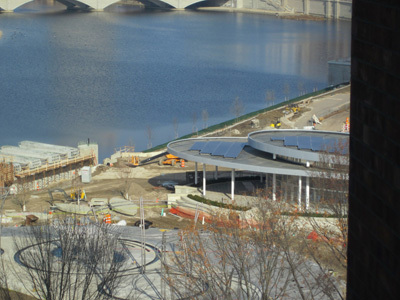 AEP envisioned the development of the Scioto Mile as an opportunity to showcase green technologies, offset operating expenses for some of the major features of the park, and also serve as a catalyst for investment in the area. AEPâ€™s involvement was more far reaching than just the installation of some solar panels. It was a total vision with an eye towards a cleaner, more efficient, greener future. Native plants, bio-retention areas for natural water filtration, and LED lighting will complement the solar energy package. It is an opportunity to educate those who frequent the new park. The area is designed as a destination for families, complete with a playground, pop up water fountains, stages, and a cafe with outdoor dining space. The cafe and water fountains will be powered in part by the solar cells, discreetly placed on the roof of the cafÃ© and an adjacent public restroom facility. Since the solar cells will not be highly visible in their perch on the roof, a meter will display the amount of electricity being generated. Vision and leadership are the essential components of this impressive new gathering area designed to entertain and educate the community. The City of Columbus, Ohio and AEP have forged a powerful partnership to lead the community forward towards a greener, healthier environment. This entry was posted on Wednesday, November 24th, 2010 at 6:23 pm and is filed under Ohio . You can follow any responses to this entry through the RSS 2.0 feed. You can leave a response, or trackback from your own site.